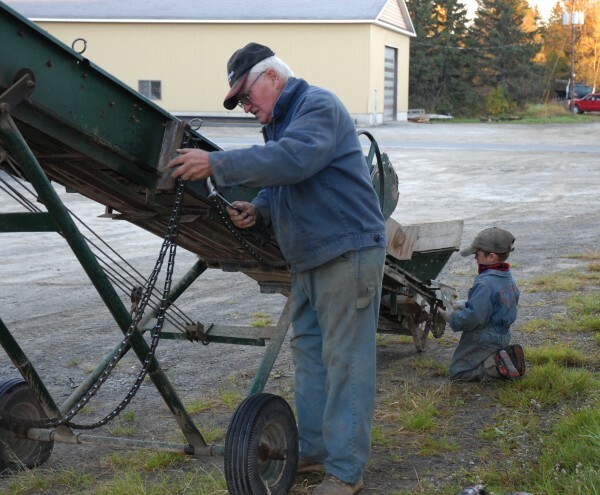 Farmer Raoul Caron gets some help from great-grandson Ethan making some repairs to a piece of potato harvesting equipment. Four generations of Carons were on the family farm during this year's harvest. 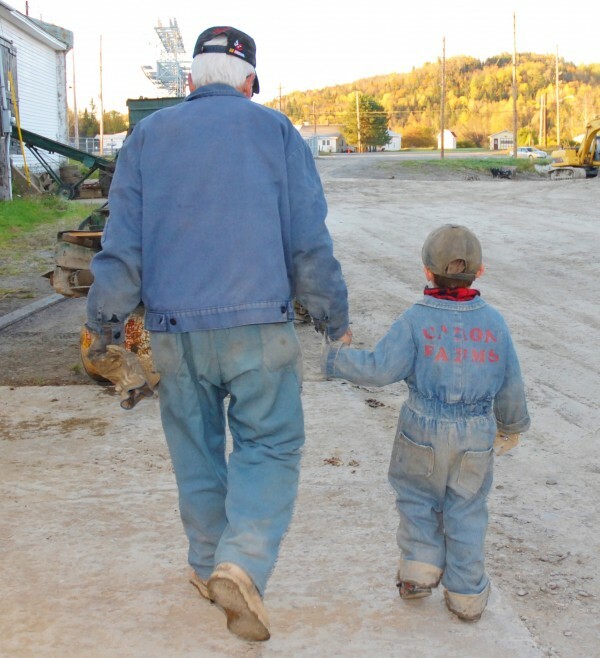 Raoul Caron walks back to the potato shed with great-grandson Ethan during this year's harvest. Ethan is a common sight during the harvest, often wearing the same coveralls worn decades ago by his father Kris Malmborg and made by his great-grandmother Lou Caron. 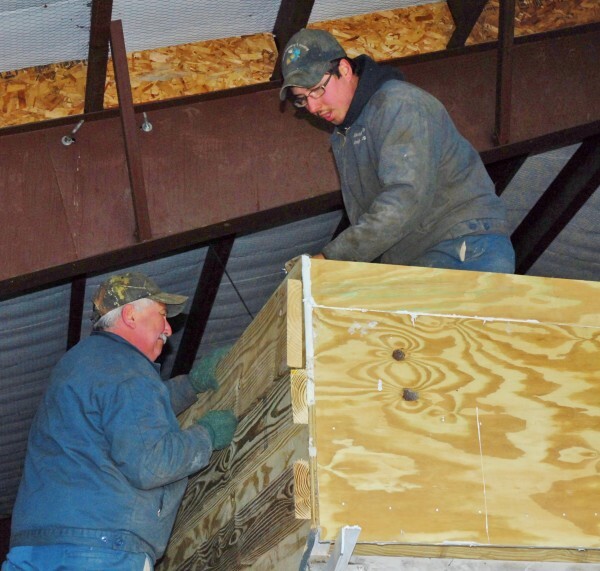 Dale Caron (left) works with his son Randy Caron to repair one of the Caron farm's fertilizer boxes. Four generations of the Caron family work together on the Raoul Caron & Sons farm in Fort Kent. FORT KENT, Maine — Sundays are a big deal at Raoul and Lou Caron’s house. Every week, around 11 a.m., pickups and cars begin pulling into the couple’s farmhouse near Little Black Lake. Out tumble three generations of the extended Caron clan as children, grandchildren, great-grandchildren and even a family dog or two all make a beeline to the side porch door leading into Lou’s kitchen. At one time, Raoul’s father, Minal Caron, ran a potato farming operation covering 1,000 acres in and around Fort Kent that employed entire families during the annual harvest. These days, the farm is run by Minal’s grandsons, though Raoul is a constant presence in the garages, barns and fields where he works side-by-side with several generations. “Getting together like this means the world to me,” Lou said at a recent gathering. That comment drew laughter and nods from around the room. “And of course, anytime you are not here, she’s always made your ‘favorite,’” laughed granddaughter Lee Babin. “Yeah, she tries to make us feel guilty, but that’s what grandmothers do,” Kris said. There is nothing quiet or calm about these Sunday meals in the Caron farmstead. Young children — all cousins — run around or bounce from adult lap to adult lap as doting parents, aunts and uncles look on. “Do your ‘Minion’ impersonation Uncle Ryan,” Kris said to his brother. Lou rarely stopped moving as she ladled chicken stew into bowls or refilled bread bowls and coffee mugs from her kitchen. Never let it be said anyone goes hungry when Lou is around. The eye of this family storm is Raoul, who is content to sit in his rocking chair and let the chaos come to him. When someone let slip the patriarch would celebrate a birthday in two days, a rousing round of “Happy Birthday” broke out. “You can bet if it were one of the grandkids birthdays, there’d be cake,” grandson Ryan Malmborg said. “Oh, I wanted to,” Lou said. Two nights later, several grandchildren and great-grandchildren surprised him with a cake. During the harvest, all the generations are at work. From son Dale driving the harvester to 5-year-old great-grandson Ethan “working” in the potato shed, everyone works to bring in the annual potato harvest. Ethan was even a regular at this year’s harvest, from helping his father grade harvested potatoes to riding along in one of the farm trucks. “I know everything about harvest,” Ethan said somewhat matter-of-factly. Each morning of harvest, Kris helped his young son get into his special famer coveralls to begin the day. Standing next to one of the fields and watching the harvest after delivering a hot lunch to the crew, Lou remembered those coveralls. Nothing has made her happier than seeing them passed down to the next generation. Grinning, Ethan cheerfully surrendered the four or five wrenches he’d collected and stored in his pockets. It was Raoul who taught most of his grandchildren how to drive on the farm. By 1 p.m., the last of the Sunday lunch dishes were washed and put away, and the families had departed into their afternoon activities. And while peace and quiet was restored to the farmhouse, it was easy to see Lou and Raoul already missed the chaos. “Food and noise, that’s what family is all about,” Lou said.